Whether you’re sending promotional or transactional email (or both), email senders often don’t think to consider what it means to say email is “time-sensitive,” except to expect that it should arrive without delay. After all, we often think of all email as being time-sensitive. The immediacy of the medium encourages the notion that every email is as timely as any other, and that they all are time-sensitive in the same way. But the truth is that the optimum timing of email messages can vary significantly, depending upon the type of message. Getting that timing right is increasingly critical in a digital universe full of distractions and crowded with competition. In fact, when it comes to delivering a relevant message, hitting the inbox at just the right time can be as important as optimizing a subject line or tailoring message content. This means “time-sensitive” is not just a euphemism for “very important!” When we’re talking “time-sensitive email,” we mean any email where delivery at a specific point in time is directly influences the value of the message. The big advantage of getting email timing right is that it ensures your message reaches the recipient when they are most receptive to its content. Remember the classic “four P’s” of marketing? Product, Price, and Promotion all transfer directly to email content. When we add in receiving email at just the right time, we now have Place, too. Allows you to reach a recipient at the moment when they’re most receptive, especially if data-driven insights from past interactions drive the email. Fosters feelings of timeliness, appropriateness, and relevance—not spam. Creates a sense of urgency that drives response to promotions or pre-event buzz-building. Demonstrates that you are engaged, communicative, and understand your customers’ needs. One obvious example of time-sensitive email are messages sent immediately after a trigger event or another cue, and are anticipated by the recipient. Examples? Welcome and confirmation emails, password resets, security alerts, and the like. The more immediate the delivery, the more likely the message reinforces trust and drives necessary next steps. Conversely, the optimum time for delivery sometimes is offset or delayed from the original action. These emails send after a certain amount of time, ranging from minutes to days, even months and years. Examples include follow-up emails and reminder emails, such as cart abandonment reminders, deadline and past-due notices, or re-subscription promotions to former customers. Date-based emails align with key dates on either the consumer’s calendar, and are sent before or after a date, too. Birthday and anniversary emails, time-based reminders, holiday promotions, and expiring membership or discount alerts are just a few examples. Limited offer emails are a classic promotion that give the recipient a limited time or other constraint (“while supplies last!”) within which to act. Examples can be anything from a flash sale alert to a sweepstakes promotion. For messages like these to work, however, they need to arrive within narrow window that drives urgency but still allows sufficient time for the recipient to take action. It’s also important to use this active judiciously; we’ve all seen examples of marketers who overuse limited-time offers and inure us to time-sensitive messages. Event-based emails are usually relevant only within the finite timeframe of a relevant event. This type of message often is used for sports or entertainment events, webinars or business conferences, and the like. Depending upon the message content, these emails have limited windows to arrive before, during, or after the event. Examples include a session reminder while at a convention, or coupons to the stadium gift shop at a sporting event. A final sort of time-sensitive email isn’t necessarily triggered by a consumer action or fixed calendar dates, but instead respond to external developments that have a limited shelf life once invoked. Reporting breaking news is a classic example. Other examples are regulatory notices like shareholder notifications or employee alerts requiring delivery within a given period. Of course, the asynchronous nature of email and the heterogeneous networks it travels means some factors simply will be out of your control. However, the right strategy, combined with an email delivery service like SparkPost that boasts great deliverability and that has the elasticity to scale on demand, help to ensure that your time-sensitive messages reach the inbox at just the right time. P.S. Want to dig deeper into time-sensitive email? 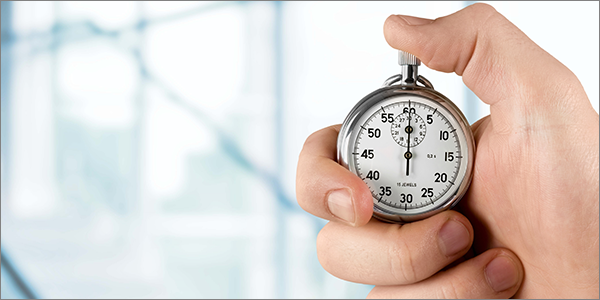 Be sure to check out our “7 Best Practices for Time-Sensitive Email” Guide.